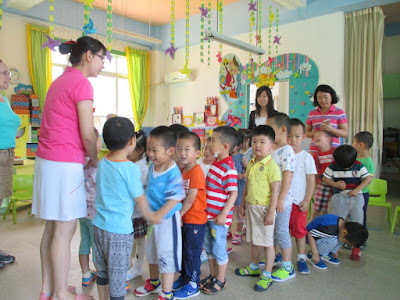 This past week, we did a combination of English teaching and professional in-service in several Chinese Kindergartens, elite places with one to ten teacher-pupil ratios, and state of the art equipment. In addition to government subsidy, parents pay steep tuition. The program is highly structured, and while there are interest centers as in American preschools, they are used very little. The day begins with teacher -led calisthenics on the school yard. There is no free play or experimentation with materials. Children learn Chinese writing, English, math, art, and rudimentary science. Their performance is precise and impressive. I like the beginning with the exercise part!